MANILA -- Police Chief Inspector Jovie Espenido on Tuesday assured that he will uphold human rights in the performance of his duties as a law enforcer while stressing that he is ready to accept his new place of assignment. 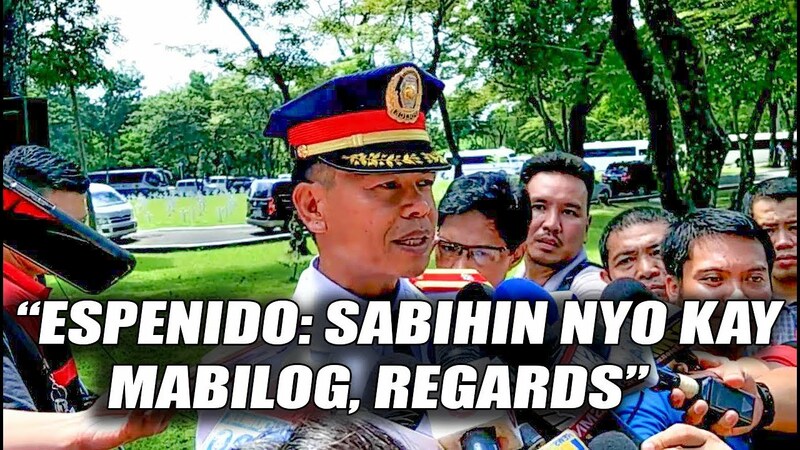 President Rodrigo Duterte has ordered the transfer of Espenido to Iloilo City which he earlier described as the "most shabulized" province in the country and named Mayor Jed Mabilog as among those in his "narco-list." “Sabi ko sa inyo, kung saan ako assigned, wala akong (iniiisip) kung ano gagawin ko, maliban sa mag-pray ako sa Lord na bigyan ako ng wisdom para magawa ko trabaho ko talaga dito na karapat dapat na di ko naman ma-violate (ang) karapatan ng tao (Wherever I will be assigned, I don't think of anything but to pray to the Lord that I be given wisdom for me to fulfill my duties without violating human rights),” Espenido told reporters on Tuesday when he appeared before the Department of Justice (DOJ) to submit a counter affidavit on the criminal charges filed against him and three other cops in connection with the death of suspected robbers last June. He maintained that he is merely following orders and is praying for guidance that he will successfully fulfill his mandate given by the President. Aside from Espenido, his co-respondents Chief Inspector Glyndo Lagrimas, Senior Police Officer 4 Renato Martir Jr., and Police Officer 1 Sandra Louise Nadayag submitted their counter affidavits to Investigating Prosecution Attorney Loverhette Jeffrey Villordon on the charges of murder and arbitrary detention. The policemen are accused of killing the suspected robbers during the series of raids in Cabinti and Balintawak villages in Ozamis last June 1 where six other suspects were arrested. Accompanied by lawyer Andres Fernandez, Espenido denied allegations of rubout during the series of raids in Cabinti and Balintawak villages where six other suspects were arrested. "I specifically deny all of her allegations. Obviously, her accusations are all fabricated and a product of the concoctions at the instance of her grandmother, who has been used by Mayor Parojinog and his group as a tool against me," read his affidavit. "It is very unfortunate that complainant has succumbed to the pressure by the Parojinog group. Understandably, she is helpless. I know fully well that this case is sponsored by the Parojinog group because the suspects involved were members of their armed group, and, more importantly to stop me from doing my job as a police officer," it stressed. Espenido insisted that it was a legitimate operation and that the robbery suspects were killed after they shot it out with the policemen. "It was a legitimate police operation. In fact the complainant herself has a sworn statement that it was the group of the criminals who fired their firearms first even before the police could disembark from their vehicles," Atty. Fernandez told reporters in an interview after the hearing. Police recovered firearms, pieces of jewelry, and sachets of suspected shabu from the suspects during the raids. The complaints were filed by relatives of Francisco Manzano, one of the nine suspected robbers killed during the encounter. Last July 30, the Ozamiz police chief led the anti-drug operations in the city which resulted in the death of Mayor Reynaldo Parojinog Sr. and 14 others.